Republican Gov. Paul LePage has opened a lead over Democratic U.S. Rep. Mike Michaud in the closing weeks of the gubernatorial campaign, according to a Maine Sunday Telegram/Portland Press Herald poll. The findings mark a significant shift from previous polls showing both candidates running in a virtual dead heat. LePage leads Michaud 45 percent to 35 percent, with independent Eliot Cutler at 16 percent and 4 percent undecided, according to the poll of 639 likely voters conducted by the University of New Hampshire Survey Center. The landline and cellphone poll has a 3.8 percent margin of error and was conducted from Oct. 15 to 21, a period that coincided with three televised debates, leaving questions about whether the forums affected the results. The findings include results that show respondents view Michaud as the more likable candidate, but they believe LePage better understands them. Two previous polls by the Telegram, one in June and another in September, showed Michaud with a small lead, but within the polls’ margin of error. Since then, LePage’s favorability and job approval ratings have improved and his Republican support is locked. Meanwhile, Michaud’s support among Democrats has declined 10 percent, he and Cutler continue to split the anti-Le- Page vote, and President Obama’s approval rating – a bellwether for Democratic and Republican voter enthusiasm – continues to fall. Andrew Smith, director of the UNH Survey Center, said the margin between LePage and Michaud is surprising, but the governor’s lead isn’t. He said similar results are appearing in other states, including Massachusetts, where a Boston Globe poll of the gubernatorial race released Friday showed Republican Charlie Baker surging to a 9-point lead over Martha Coakley after weeks of the two candidates exchanging small leads. Smith said a number of factors could be contributing to LePage’s advantage, including Republican enthusiasm for the midterm election and a bear baiting referendum that is energizing voters who aren’t normally engaged in state elections. “The biggest factor that’s still up in the air is turnout,” Smith said. “The poll shows how the race looks at a moment in time, but the race will ultimately be decided by who gets out the vote and that’s extremely hard to do,” especially for Democrats in a midterm election shadowed by Obama’s sagging popularity. Maine Democrats and aligned interest groups have poured significant resources into voter mobilization. The success of those operations could determine whether Michaud can win. The enthusiasm difference is reflected in a question about who will win. The poll found 50 percent of voters, including 20 percent of Michaud’s supporters and 31 percent of Democrats, now think LePage is going to win Nov. 4, compared to 34 percent for Michaud and 2 percent for Cutler. In the Telegram’s September poll on the same question, Michaud and LePage were virtually tied while 5 percent thought Cutler would win. In the June poll, 43 percent thought Michaud would win, 31 percent picked LePage and 7 percent said Cutler. The who-will-win question is used by polling firms because it measures party enthusiasm and has proven to be a better predictor than asking voters their preferred choice. The perception of who can win is also affecting Cutler. Bill Cline, 54, of Biddeford is a registered Democrat who voted for Cutler in 2010. He considers himself an independent, but he’ll vote for LePage this year, primarily because of his stance on welfare. Cline works two jobs and believes people who need help should get it, but that some people are getting help when they could be working. He’d like to support Cutler. The governor is also performing better in head-to-head contests with his two challengers, another change from the previous Telegram surveys, which showed Michaud or Cutler handily defeating him. LePage now leads Michaud, 50 percent to 43 percent, in a two-way contest. 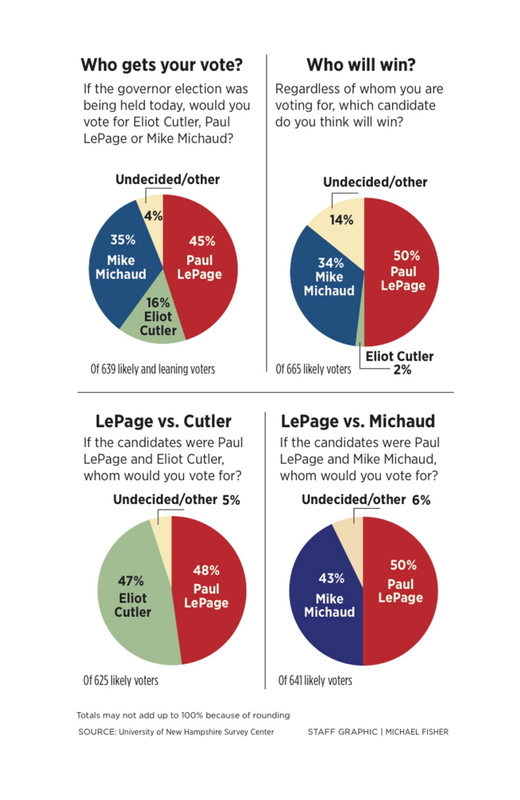 Sixty-four percent of Cutler’s supporters said they would vote for Michaud in a two-way race, 27 percent said LePage. A race between Cutler and LePage would result in a statistical tie, with 91 percent of Michaud supporters saying they’d vote for the independent. The Republican enthusiasm is reflected in the who-will-win question and the polling sample. In the previous two Telegram polls, more Democrats than Republicans and independents participated. The split is more even in the new poll. Smith said it was possible that the debates had an impact on the poll, but that could not be quantified by the data. The survey did not ask voters how the candidates performed during the debates. Interviews with voters after the September poll suggest that some people were eager to see the candidates on the same stage. Smith also highlighted the impact of the bear baiting referendum, or Question 1. It asks voters if they want to ban the use of bait, dogs or traps in bear hunting. He said the issue appears to be drawing interest from voters not normally engaged in state elections, particularly in rural Maine and the more conservative 2nd Congressional District. LePage is beating Michaud 48 percent to 33 percent in the district, which the congressman has represented for six terms. All three candidates publicly oppose the referendum. However, LePage, whose Department of Inland Fisheries & Wildlife was sued for allowing wardens to appear in ads opposing the ballot question, appears to be the biggest beneficiary of the opposition movement. Twenty-one percent of the Democrats who said they are voting against the referendum are also supporting LePage. Obama, who is scheduled to stump for Michaud in Portland on Thursday, is underwater in Maine. The new poll has the president at his lowest approval rating of the three Telegram surveys. Fifty-five percent disapprove of Obama, 39 percent approve and 6 percent are undecided. Seventy-five percent of Democrats still approve of Obama’s job performance, a 7-point drop since the September poll. The president remains unpopular with independents – 65 percent disapprove of his job performance. Michaud’s dip in support coincides with his declining favorability. Michaud is the most liked of the three candidates, but his favorability has taken a hit since September. The poll shows 46 percent of likely voters have a favorable opinion of Michaud, 39 percent have an unfavorable opinion, 6 percent are neutral and 9 percent don’t know enough about him to say. That leaves his net favorability at 7 percent, which is down from 24 percent since September. LePage is the most disliked of the candidates. Forty-seven percent say they have a favorable opinion of the governor, 48 percent have an unfavorable opinion, 5 percent are neutral and 1 percent don’t know enough to say. LePage’s job approval has risen. Smith said the danger zone for incumbents is a job approval rating of 46 percent or less. In June, LePage’s job approval was 41 percent, but he’s climbed 8 points since then, to 49 percent approval, with 48 percent disapproval and 3 percent neutral. The climb represents another problem for Democrats. The Michaud campaign and Democratic groups have focused on the governor’s bombastic and “divisive” style of governing. People who said they planned to vote for LePage all acknowledged his verbal missteps, but still like him. Robert Lockhart, 64, of Pemaquid, a registered Republican, said he liked the governor’s fiscal restraint. He supported LePage in 2010 and will do so again. “I think in spite of some comments that he makes from time to time, that he probably regrets himself, I think overall he’s done a good job on rebuilding the economy and putting Maine back in the right direction,” he said. Lockhart’s view of LePage as fiscal manager is reflected in the poll. Forty-seven percent said the governor would be the most effective at managing the state budget, 25 percent said Michaud, 17 percent said Cutler, 1 percent said there was no difference and 9 percent were unsure. Respondents said Michaud is the most likable candidate and the second most likely to work with both parties. However, when asked which candidate best understands people like them, 41 percent said LePage, 28 percent said Michaud, 19 percent said Cutler, 3 percent said there was no difference and 8 percent were unsure. Nearly half (47 percent) said LePage was a stronger leader, compared to 26 percent for Michaud, 14 percent for Cutler, 1 percent said no difference and 11 percent were unsure. Smith said the LePage opposition vote is still a factor, but it’s unclear if it’s enough for his rivals to prevent a second term. Political action committees aligned with Democrats have been circulating ads saying that a vote for Cutler is a vote for LePage. Some Cutler supporters said they would vote for Michaud if they didn’t think the independent can win. Other Cutler backers, such as 70-year-old Kenneth Ault of Harpswell, weren’t sure. Ault said he’d vote for Michaud if Cutler gets out of the race. And if he doesn’t drop out? 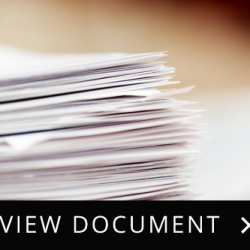 The UNH Survey Center is an academic and public opinion survey research institute that conducts between 40 and 50 surveys every year for a range of for-profit and nonprofit clients. Its media clients have included CNN and Fox News, The Boston Globe and New Hampshire Public Radio. It has operated since 1976 and polled election races in the Granite State and the presidential primary. Statistician Nate Silver’s FiveThirtyEight blog recently ranked the UNH Survey Center 51st out of 337 polling firms for accuracy. The Pew Research Center was ranked 50th.